I’m having a very hard time getting back into the blogging-swing-of-things— especially when it comes to taking pictures. There are really only a few good hours of light on each of these short, autumnal days and I missed them because I was writing. I drove over to a distant suburban Starbucks, the banality of which often assuages my crushing anxiety. While the coffee shops closer to campus are filled with the palpable angst of too many bespectacled MacBook users, I’m generally the only such individual in the western reaches of town. Mostly, there are retired men eating muffins, women with giant sparkly diamonds, and toddlers. While I can’t speak for the toddlers— who do seem to feel a kind of angst towards their small boxes of chocolate milk— the breeziness of these patrons reassures me as I labor over the same three words, hour after hour. As a result of my suburban jaunt during the best hours of daylight, you get a rather poor photograph of a whale. 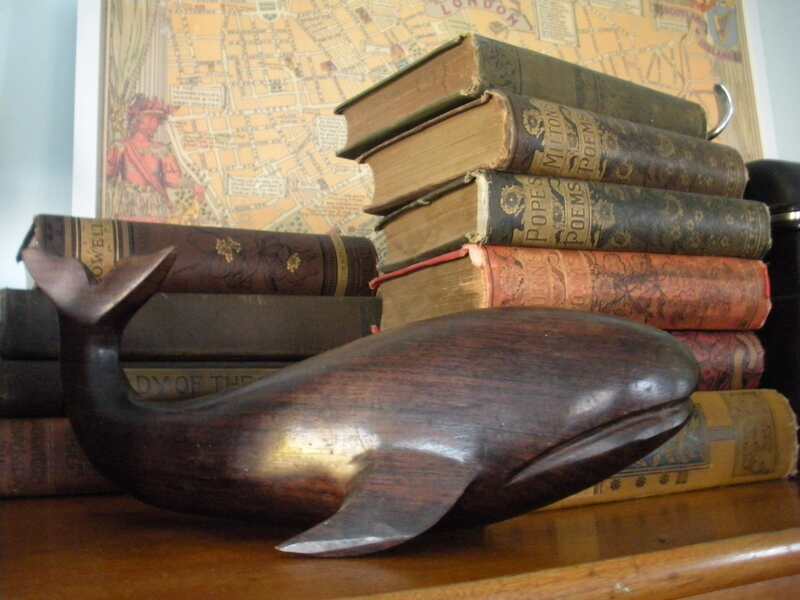 This whale seems to date from my earliest memories of our house in Colorado Springs; I can’t remember a time when it wasn’t on a teak bookshelf in my parents’ bedroom. Perhaps this wood-grain cetacean is to blame for my enduring obsession with all things zoomorphic. Or maybe it was the My Little Ponies that did it. i like your daily blogging and am glad you too have banal rituals to stave off crushing anxiety. mine is grocery shopping. what is the map behind the whale? grocery shopping! I like Target, too. So soothing. The map is London— and a piece of wrapping paper, really.